The organisms that carry out oxygenic photosynthesis do so in order to survive. As obligate photoautotrophs, they must utilize light energy to produce the ATP and NADPH that is used to reduce CO2 to carbohydrates. These carbon compounds can then be metabolized to produce the amino acids, nucleic acids, fatty acids and other compounds that are required for growth and reproduction. In some of the earliest research to employ isotopes of the elements, Martin Kamen and Samuel Rubin carried out classic experiments that showed that carbon dioxide was fixed by algae, and Melvin Calvin and his associates used this technique to follow the incorporation of 14CO2 into the intermediates in what is now known as the Calvin Cycle for CO2 fixation (Benson, 2002). The quest for the source of electrons for CO2 reduction has its origins in experiments of Priestley and Lavoisier (Jackson, 2005). Lavoisier established O2 as a causative agent in the rusting of iron, and, more importantly, showed that it was involved in animal and plant metabolism. Joseph Priestley showed that plants could purify "dephlogisticated" air that had been created by burning a candle in a closed bell jar. However, his studies on the role of plants in this process were inconclusive. He never demonstrated that light was involved in the process of "dephlogistication", which occurred when a plant was placed in the bell jar. The requirement for light was discovered by Ingenhousz several years later, but it was not until the twentieth century and the advent of O2 isotopes that it was shown that in fact O2 was liberated from H2O in plants, algae and cyanobacteria exposed to light. Research leading up to the mid-twentieth century characterized the response of the photosynthetic apparatus to various wavelengths of light, and Hill and Bendall (1960) then proposed their famous "Z" scheme model for light-driven photosynthetic electron transfer. In this model, it was proposed that two separate light reactions or photosystems were responsible for the conversion of light energy into chemical energy. What is now called photosystem II (PSII) was proposed to catalyze the oxidation of water; the other light reaction (photosystem I (PSI)) received these electrons by way of an electron transfer chain that contained cytochromes. Duysens and Sweers carried out a classic experiment in which it could be shown that one of the cytochromes (cytochrome f) could be oxidized by light absorbed by one photosystem (PSI), and then reduced by light absorbed by a second photosystem (PSII) (Duysens, 1963). This experiment validated the "Z" scheme model, and other investigators took up the idea of two light reactions in oxygenic photosynthesis. Overwhelming experimental evidence accumulated in support of the existence of the two photosystems, and the rest of the photosynthetic electron transport chain that is described in detail in biochemistry textbooks (Berg et al., 2001; Nelson and Cox, 2008; Voet and Voet, 2012). In spite of the enormous strides that have been taken to understand the structure and function of the photosynthetic apparatuses (Nelson and Yocum, 2006), elucidating the mechanism of water oxidation by PSII remains one of the principal challenges in the field of molecular bioenergetics. The fundamental insight into the H2O oxidation reaction in PSII was obtained by Pierre Joliot (Joliot et al., 1968) and by Bessel Kok (Kok et al., 1970; Forbush et al, 1971). These investigators used isolated chloroplast thylakoid membranes, which contain chlorophyll and the other components of the photosynthetic electron transport apparatus. These membranes were deposited on very sensitive bare platinum electrodes where small, rapid changes in O2 concentration could be measured. The membranes were dark-adapted, and then exposed to very short (~10 µs) flashes of light from a xenon lamp that triggered one-electron transfers, which are also called single turnovers. 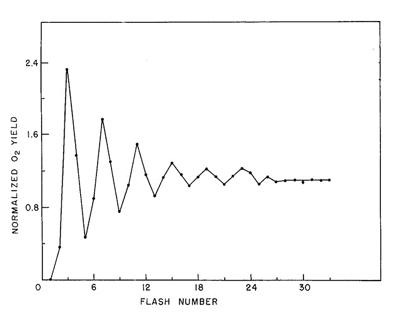 By firing a series of flashes with short dark intervals between them, an unusual oscillating pattern was observed. An example of this behavior is shown in Figure 1. Figure 1. Oscillating O2 yield from chloroplast thylakoid membranes illuminated by short (<10 µs) light flashes. The O2 "gushes" appear with a periodicity of four, revealing that the O2 evolving reaction is a linear four-step redox reaction. The appearance of O2 on the third flash is interpreted to indicate that the catalyst of H2O oxidation is already oxidized by one electron in dark-adapted membrane preparations. The first phenomenon that contributes to damping is called "misses". There are a couple of explanations for this behavior. For example, a reaction center can fail to trap and absorb a photon. When this happens, the reaction center lags behind other centers, releasing O2 on a later light flash. Alternatively, a center may absorb a photon, but because the preceding electron has not yet been released, the second electron back reacts, or recombines with the reaction center chlorophyll. The other reaction that contributes to damping in the pattern of O2 oscillations is known as "double hits". In this case, a center reacts normally upon absorption of a qauntum of light, recovers, and is then excited a seond time by weak light emission from the flash lamp as it decays away. The net effect of this is to advance such a center by two states rather than one. Technically, this problem has been decreased in severity by replacing xenon flash lamps with lasers, whose outputs are shorter by a couple of orders of magnitude. With the exception of S4, the S-states have variable stabilities. For example, the decay of S2 to S1 occurs with a t1/2 on the order of 30 s, whereas the decay of S3 --> S2 --> S1 has a t1/2 of about 80 s. The S4 state decays to S0 in about 1.4 ms during the formation and release of O2. The availability of purified PSII preparations (Berthold et al., 1981), and a systematic analysis of the components and activities of these preparations, have shown that the catalyst of O2 evolution in PSII is an inorganic ion assembly comprised of four Mn atoms along with one atom each of Ca2+ and Cl- (Yocum, 2008). Electron transfer between this inorganic ion cluster and the oxidized chlorophyll reaction center P680+ is mediated by a redox-active tyrosine residue called YZ in the primary amino acid sequence of the PSII reaction center protein called D1 (Barry, 1993). P680 is a dimer of chlorophyll a molecules that ejects an electron upon excitation by light; pheophytin a, a chlorophyll molecule lacking the Mg2+ atom in the center of chlorin ring, accepts an electron from P680 and passes it on to QA and QB, which are plastoquinone molecules. Additional details can be found in the module on Photosynthetic Reaction Centers. Calcium and Cl- are both required for oxidation of the Mn atoms by chlorophyll photochemistry. Omission of Cl- blocks the S2 --> S3 transition (Wincencjusz et al., 1997), and Ca2+ is required for all of the transitions except perhaps S0 --> S1 (Miqyass et al., 2008). The roles of these ions is still under investigation, but current available data show that Ca2+ is a structural element in the metal cluster and is also likely to be a site for binding of the substrate H2O molecules that undergo oxidation (Yocum, 2008). Chloride is probably utilized to regulate the redox activity of one or two of the Mn atoms. Most current models for the mechanism of H2O oxidation propose that formation of the O-O bond occurs in the S4 state, for example by nucleophilic attack of a calcium-bound hydroxyl group on a Mn-oxospecies, Mn5+=O (McEvoy and Brudvig, 2006). The succeeding oxidation reduction reactions produce S0 and O2 is released. Photosystem II preparations from thermophilic cyanobacteria have proved to be amenable to crystallization, and structural models derived from these crystals have been presented at resolutions between 3.5 and 3.0 Å (Ferreira et al., 2004; Loll et al., 2005). Progress in this area is exemplified by the results of Umena et al. (2011), who improved the resolution to 1.9 Å. Features of the electron transfer cofactors have been derived from these models, and one of these is shown in Figure 2. All reaction centers have a symmetric disposition of cofactors, and PSII and photosynthetic bacteria employ only one of these branches to carry electrons. Electron transfer is initiated by the absorption of a photon by P680 (Eq. 2), and the electron is transferred down the left side of the structure, so that QA is the first quinone to be reduced, as illustrated by Eq. 3 in the preceding section. Reduction of P680+ is accomplished by a transfer of an electron from the Mn4Ca cluster through YZ, the redox-active tyrosine residue, again as shown by Eq. 2. Cyanobacterial PSII contains more than 20 separate proteins, and in algae and plants that number is even higher owing to the presence of a number of chlorophyll-binding antenna proteins. To give a sense of the complexity of the photosystem, an example of the structure of a monomer of PSII from cyanobacteria is shown in Figure 3. The approximate locations of the Mn4Ca cluster and the binding sites for quinones are indicated. All of the PSII's examined so far contain extrinsic (H2O soluble) proteins that bind with high affinity near the site of H2O oxidation to assure retention of Ca2+ and Cl-. These subunits are indicated in yellow, magenta and dark blue in the figure. The membrane spanning subunits are characterized by the presence of helices in the regions that cross the lipid bilayer, and are identified by the bracket in the figure. A careful analysis of this and other structures of PSII, and further research on the chemistry of the Mn/Ca/Cl cluster are necessary to understand the details of the reaction that powers life on earth. Figure 3. 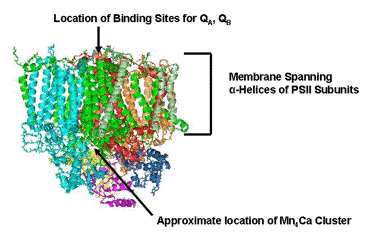 Protein structure of cyanobacterial PSII. The model shown here is one of the monomers that makes up the dimeric species that crystallizes. The extrinsic subunits that shield the site of H2O oxidation are shown in yellow, magenta and dark blue. Progress in understanding the O2 evolving reaction of PSII has been remarkable. The early experiments of Kok and Joliot (Figure 1, Eq. 1) provided the impetus for succeeding generations of experimentation that have revealed the inorganic components of the reactions as well as the proteins that are required for the conversion of light energy into the redox reactions that produce O2. For most of the intermediates in the reactions that produce O2, the oxidation states of the catalyst Mn atoms have been determined, and Ca2+ and Cl- have been established as essential activators of the reaction. This has in turn produced very useful hypotheses for how H2O is oxidized: the Mn atoms function to store the oxidizing equivalents in the chlorophyll-catalyzed photocycle that are used to oxidize H2O, Ca2+ functions as a binding site for the substrate H2O molecules, and Cl- regulates the redox activity of the Mn atoms. Future research will provide more refined details about the mechanism of the reaction. The site of the reaction in PSII is now localized in structures of the enzyme, and the organization of the cofactors is known to a resolution of about 1.9 Å. Now it is possible to see in detail how the absorption of photons by chlorophyll triggers the sequence of reactions that transfer electrons across a large, complex enzyme system, and sets the stage for O2 release into the biosphere. Barry, B.A. The role of redox-active amino acids in the photosynthetic water-oxidizing complex. Photochem. Photobiol. 57, 179-188 (1993). Benson, A.A. Following the path of carbon in photosynthesis: a personal story. Photosyn. Res. 73, 29-49 (2002). Berg, J.M., Tymoczko, J.L. and Stryer, L. Biochemistry. 5th ed. Chapter 19. W. H. Freeman and Company, New, NY (2001). Berthold, D.A., Babcock, G.T. and Yocum, C.F. A highly resolved, oxygen-evolving photosystem II preparation from spinach thylakoid membranes. EPR and electron-transport properties. FEBS Lett. 134, 231-234 (1981). Duysens, L.N.M. Role of two photosynthetic pigment systems in cytochrome oxidation, pyridine nucleotide reduction, and fluorescence. Proc. Royal. Soc. London 157, 301313 (1963). Ferreira, K.N., Iverson, T.M., Maghlaoui, K., Barber, J., and Iwata, S. Architecture of the photosynthetic oxygen-evolving center. Science 303, 1831-1838 (2004). Forbush, B., Kok, B. and McGloin, M.P. Cooperation of charges in photosynthetic O2 evolution-II. Damping of flash yield oscillation, deactivation. Photochem. Photobiol. 14, 304-321 (1971). Hill, R. and Bendall, F. Function of the two cytochrome components in chloroplasts: a working hypothesis. Nature 186, 136-137 (1960). Jackson, J. A world on fire. A heretic, an aristocrat and the race to discover oxygen. Viking Press, New York, NY (2005). Joliot, P., Barbieri, G., and Chabaud, R. Un nouveau modele des centres photochimiques du systeme II. Photochem. Photobiol. 10, 309-329 (1969). 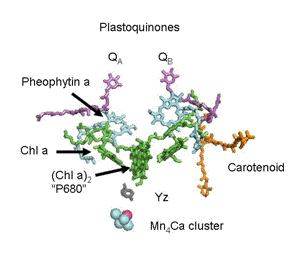 Kok, B., Forbush, B., and McGloin, M. Cooperation of charges in photosynthetic O2 evolution-I. A linear four step mechanism. Photochem. Photobiol. 11, 457-475 (1970). Loll, B., Kern, J., Saenger, W., Zouni, A., and Biesiadka, J. Towards complete cofactor arrangement in the 3.0 Å resolution structure of photosystem II. Nature 438, 1040-1044 (2005). McEvoy, J.P. and Brudvig, G.W. Water-splitting chemistry of photosystem II. Chem. Rev. 106, 4455-4483 (2006). Miqyass, M., Marosvolgyi, M., Nagel, Z., Yocum, C.F. and van Gorkom, H.J. S-state dependence of the calcium requirement and binding characteristics in the oxygen evolving complex of photosystem II. Biochemistry 47, 7915-7924 (2008). Nelson, D.L. and Cox, M.M. Principles of Biochemistry. 5th ed. Chapter 19. W. H. Freeman and Company, New, NY (2008). Nelson, N. and Yocum, C.F. The structure and function of photosystems I and II. Ann. Rev. Plant Biol. 57, 521-565 (2006). Umena, Y., Kawakami, K., Shen, J.-R. and Kamiya, N. Crystal structure of oxygen-evolving photosystem II at a resolution of 1.9 Å. Nature 473, 55-60 (2011). Voet, D. and Voet, J. Biochemistry. 4th Ed., Chapt. 24, John Wiley and Sons, New York, NY (2012). Wincencjusz, H., van Gorkom, H.J., and Yocum, C.F. The photosynthetic oxygen evolving complex requires chloride for its redox state S2-->S3 and S3-->S0 transitions, but not for S0-->S1 or S1-->S2 transitions. Biochemistry 36, 3663-3670 (1997). Yocum, C.F. The Ca2+ and Cl- requirements of the O2-evolving complex. Coordination Chemistry Reviews 252, 296-305 (2008).